CORVALLIS, Ore. – A groundbreaking two-year study in southern Oregon found greater abundance and diversity of wild bees in areas that experienced moderate and severe forest fires compared to areas with low-severity fires. The study, published today in the journal Ecosphere by researchers in the Oregon State University College of Forestry, is the first to demonstrate that wildfire severity is a strong predictor of bee diversity in mixed-conifer forest. Bees are the most important among the Earth’s pollinators, which combine for an estimated $100 billion in global economic impact each year. 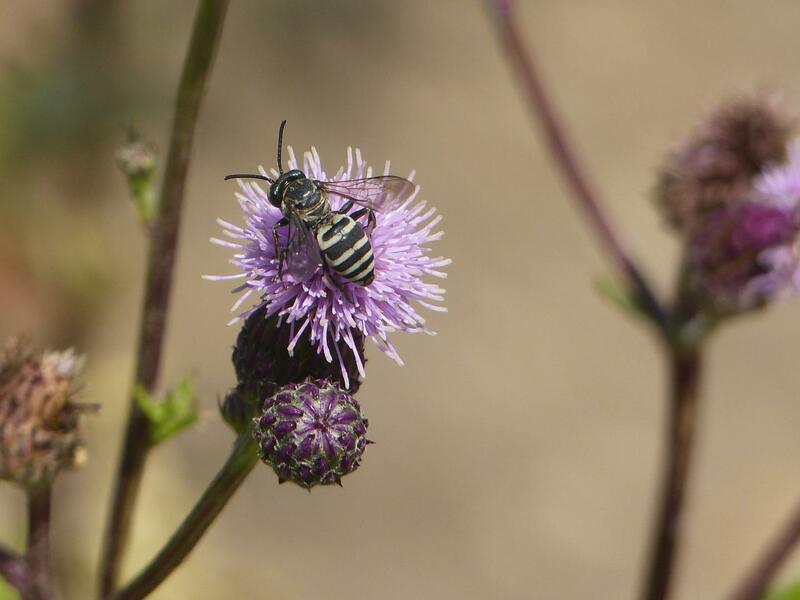 Oregon is home to more than 500 species of native bees. Animal pollinators enhance the reproduction of nearly 90 percent of the Earth’s flowering plants, including many food crops. The pollinators are an essential component of insect and plant biodiversity. Bees are the standard bearer because they’re usually present in the greatest numbers and because they’re the only pollinator group that feeds exclusively on nectar and pollen their entire life. Scientists led by OSU forest wildlife ecologist Jim Rivers in 2016 began trapping bees at 43 sites in forests burned by the 2013 Douglas Complex fire that scorched nearly 50,000 acres north of Grants Pass. They collected bees with blue-vane traps, which attract the insects by reflecting ultraviolet light, and used satellite imagery to determine fire severity. At low-severity sites, flames were mostly confined to low-growing vegetation. In contrast, some of the high-severity sites had a completely open canopy. And the two most abundant genera among the trapped bees, Bombus (bumblebee species) and Halictus (sweat bee species), each responded positively to high fire severity despite having different foraging ranges. Previous studies primarily just considered, “did it burn or didn’t it burn? '” Galbraith said. The Bureau of Land Management and the College of Forestry supported this research.